So basically the thing is, i want to send files to mobile devices without installing any software in mobile handset. So how can i do that? Obviously google. You can send files to mobile device using OBEX, a file transfer protocol for bluetooth devices, it's in jsr82. And there is a api known as bluecove which has things ready made :). Supported stack(don't ask me what it is, i know little about i) list can be found here. A list of jsr82 compatible handsets can be found here. I work with netbeans, you can get the latest netbeans ide from here. You will need the bluecove-api jar, and you can download from here. The jar i used was named "bluecove-2.1.0.jar", Now here is an issue, if you want your application to run in ubuntu/linux then you will also need a jar called "bluecove-gpl-2.1.0.jar" which can be found in here. 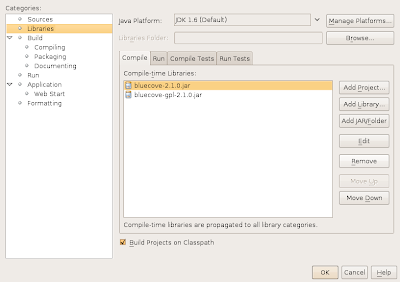 So copy this jars to the netbeans project folder. And add these jar's in the project libraries, go to project properties and from libraries at left select add jar/folder and show the jars. Now you are ready to use bluecove with your project. Do some coding things as you like. Here I am going to make an application which will discover devices around it and send them a file. I used real bluetooth devices and handset. There is also possible to use emulators to emulate bluetooth dongle and also mobile device. But I don't know how, you can let me know if you find a easy one. 2. BluetoothBrowser: a class that discovers remote devices and put them in a list, and this class is also used to find the OBEX url for sending files to remote device. 3. A sender class which sends file to remotedevices using the OBEXUrl found previously. But this was not working for me, this is a port number in remote device in which obex service is running, but this port number is not valid for all handsets. For nokia it works fine, but in Sony Ericsson the obex port number is 6, so to make the program independent a findObex function was used to query the remote device to know it's obex connection url and then it was used to send the file. So more generic way. This part almost made me to fail as I was not able to do while the port number was 9 with sony ericsson. The other codes are there, you might find similarity with codes in the net. But what can i do , i am a google coder. So things are copy paste copy paste bla bla. The application starts discovery first then tries to send a jpeg file from "C://a.jpg" file. Enought talking, now the happy part, the Source Code :). The full source can be found here. The code is not tested, i plugged my code from other projects and made a quick project. So if you find now working let me know. It will save your time, in ubuntu i was getting bluecove stack not found though my bluetooth device was there, just running the above command will solve the issue, And remember to include the bluecove-gpl-2.10.0 jar with your project. the gpl jar has to be with the same version of your main bluecove jar. I think i am still not clear to you. what can i do i am bad at writing and explaining. The next one i am wishing to write is "How you can receive contacts/vcard/business card" from mobile devices using obex. But in my pc it can send files to mobile handsets. If you are running under windows xp service pack 2, then uninstall bluesoleil and restart your pc and try to run the code again, then the bluetooth will work with the default bluetooth driver provided by microsoft. No problem with the set, i also worked with w810i before. It has driver to access bluetooth devices. Hi,very nice article,,I tried running the code ...it sends the message but the program doesnot end!!!! Also,how can I make it rerun automatically??? Pleeeeeese could u answer me ASAP?? Hi Shimul, thanks a lot for the code, but I would like to ask how can i directly send the a.jpg to a specific phone considering that i have the phone's BT address and ObexURL. What are the necessary portions that I would need to make it work? }I am getting compilation errors so I guess I must have messed up somewhere. Can you help me point out my mistakes? Thank you again Shimul. It was excellent article which gave me an elementary idea on bluetooth implementation. It was very useful. I have changed the UUID part also add attrset as below. Now it is working with all the mobiles like Nokia,Sonyeric,Windows mobile. I need a code sample which will send a text message from PC to mobile via bluetooth ( i am using blue cove and bluesoleil in the PC ) despite sending files. Can any one of you pls help. Thanks Shimul for this cool article, helps a lot! I am trying like Ryan to remove the user interface. I know its a bit off-topic, but do you know what modifications I have to do to get it to run only in the terminal and that it wont shutdown like that? Also, I cannot find where to put a System.exit() once the file has been pushed once to all the detected devices. Looks like bluecove requires an UI application to work. the RefreshList is starting the threads to send files to remote devices. As we don't know when the threads will end so we cannot just call system.exit from this function. What we can do is keep count of number of threads started to send files, and from the each thread when files are sent they can acknowledge the main class that the file is sent. And in there if we see all files are sent then we can exit the application. Also, since its possible to know how many devices have been detected, it should be quite easy! I am sorry to come back on to you one more time, but there is something I do not understand in this script. The problem is that this method is executed twice for the devices where the responseCode returns SERVICE_SEARCH_ERROR, and I dont understand why. As a reminder, I am trying to have 2 versions of the script. The second version will be alike, except that instead of exiting, it will just launch itself again. ok pierro, here is the thing. First we do device search. Then we try to find the obex url of this device by doing another service search. And in the obex search there is two method it tries to find the obex url, in the BluetoothBrowser class you will find a method called findobex, here you will see the code is trying to do two service search if one fails. I think that might be causing such results. Can you check. I don't have the system ready in my pc so i am not able to test myself. shimul good article.I got the basics of bluetooth fuctionality thanks.Can i use this code n modify it to send files from my mobile to pc and store it in pc.please help! I had use file sending part of this code along with code given on jsr82.com and it works well..
Hi, thanks for the article. I have a question. Why do I get an exception when i reject receiving files? javax.bluetooth.BluetoothConnectionException: Failed to connect;  A socket operation failed because the destination host was down. My question is, why this exception come out? And why is responseCode from obex is null, and not some other number? How can I know if user rejected receiving, and not bluetooth timed out? Because when a session times out I get the same exception. This is very important for me. Please help me. The files sent are received in mobile inbox. any way to send it to a folder in memory card. It's not working for me, I'm using Windows Xp.